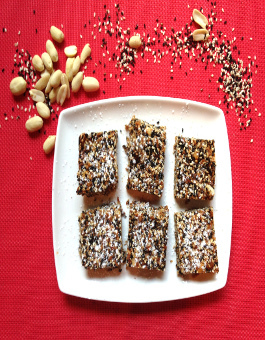 My homemade sesame bars are a quick & easy way to grab an actual wholesome snack! We often gravitate toward power and granola bars when we’re on the go or craving an afternoon snack. However, many of these store brands are far from a smart choice – most are full of sugar and fat, with their nutritionals bearing closer resemblance to candy bars than anything healthy. 1. Preheat oven to 350 F. Line a 9”x9” square baking pan with parchment paper, leaving an overhang on all sides so you can easily remove from pan. 2. Combine all ingredients in bowl and mix well. Press firmly into baking dish and bake for 20 minutes, or just until edges are slightly browned.